When you visit the Cave and Basin National Historic Site in Banff, Alberta, follow the tunnel and stairs through the rock walls of Sulphur Mountain to the cave where the interior pool is located along with the original vent hole. As you enter the tunnel, be prepared for your senses to quiver at the smell of sulphur as the water has come from far below the ground to reach the surface. Two smaller pools located nearby in the tunnel are alive with small fish, insects, algae and pink bacteria. Other areas to explore while at the Cave and Basin National Historic Site is interactive exhibits, walks along trails and boardwalks in the woods and marshes, the gift shop and the snack bar. A fascinating tourist attraction which dates back to the late 1800's when the pools were used for healing purposes. 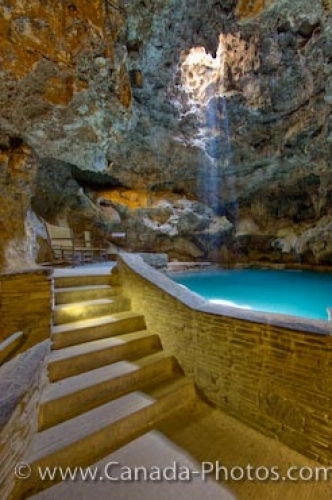 Picture of a pool at the Cave and Basin National Historic Site in Banff, Alberta.